First part @ 2 p.m.
Second part @ 8 p.m. These three long music performances each started with a question: Can a musical piece be composed with exactly the same process that an artist uses to create their conceptual artworks? Since September, we have worked with three artists to explore new ways of understanding how music can be made out of nothing. Deborah Carruthers is an artist that explores the various facets of science around the anthropocene to create multi-disciplinary artworks. David Szanto’s work focuses on our personal, intimate relationship to food and eating to create his performances. Angelique Willkie’s choreographies explore personal, autobiographical narratives and minute everyday movements. 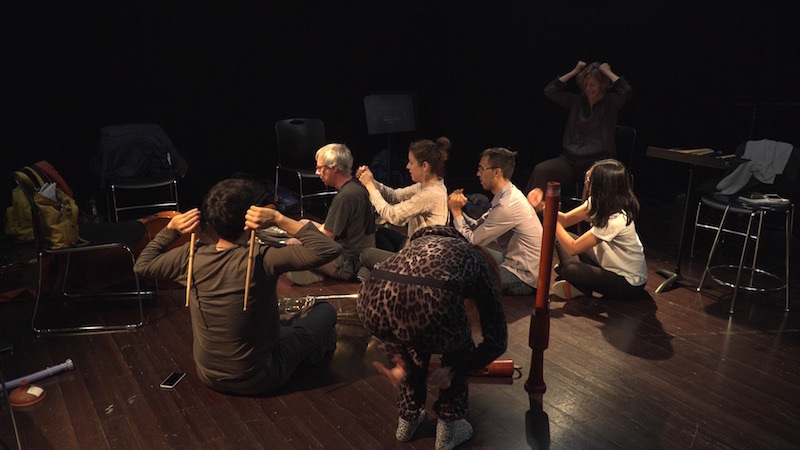 In their encounters with these artists, the musicians of the Ensemble Ekstasis tried to explore their practice with the ideas the artists gave them: what kind of intimate biological relationship do musicians have with their instruments? How can a musician read another musician’s movements as their score? How can the audience co-create a musical performance with their cellphone cameras? Does your listening change if your tongue senses a different taste? How does our meat and cow culture affect our musicking ? What does really constitute a piece of music – according to the SOCAN? All these questions led to three exciting, inquisitive, enlightening hour-long performances which will be presented on Dec 16 in two locations at two times: at 14h we will discuss the research-creation project “Ecstasies of Influence” at Le Gésu, and then première the Bee Symphonie by Deborah Carruthers. And at 20h we will perform the two works created with David Szanto and Angelique Willkie in the “Fine Arts Black Box” at Concordia University. If you have ever asked yourself what the farthest reaches of musical space could be, this day of inter-artistic explorations is for you.